From College Station: Take University (Hwy 60) west towards Snook for 10 miles. Turn left at large Snook billboard onto TX 2155. Stay to the left after passing the High School and continue for 5 miles. Turn right onto County Road 275. Turn Right onto County Road 270 at dead end. Camp is a ¼ mile on the right. 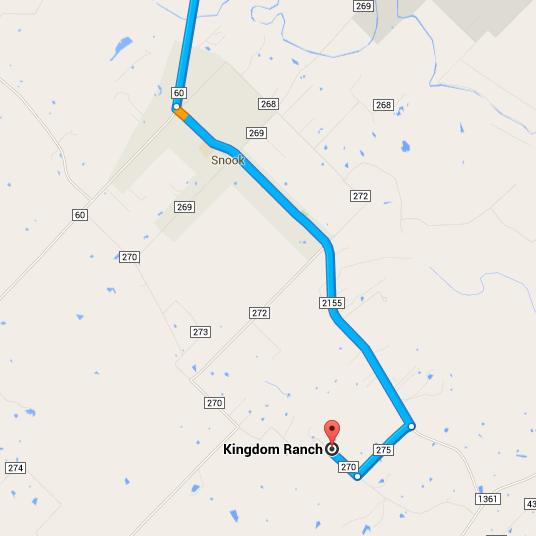 If using a GSP input “Kingdom Ranch” instead of the physical address for the most accurate directions to Camp.